One way to force President Donald Trump to put the brakes on his dangerous "energy-dominance" policy is a lawsuit filed on behalf of 21 young people. Using a barrage of legal motions, the administration's lawyers are scrambling to keep this case, known as Juliana v. United States, from going to trial. As environmental law professors, we have written about this remarkable case and are teaching our students about it. This case positions the climate crisis squarely in the realm of fundamental civil rights jurisprudence, where we believe it belongs. Spearheaded by Our Children's Trust, a nonprofit, this lawsuit is pending in a federal court in Oregon. It challenges U.S. energy policies on the basis that they are destabilizing the climate and violating established constitutional rights to personal security. The case originally took aim at the Obama administration when lawyers first filed the case in 2015. It now targets the Trump administration. 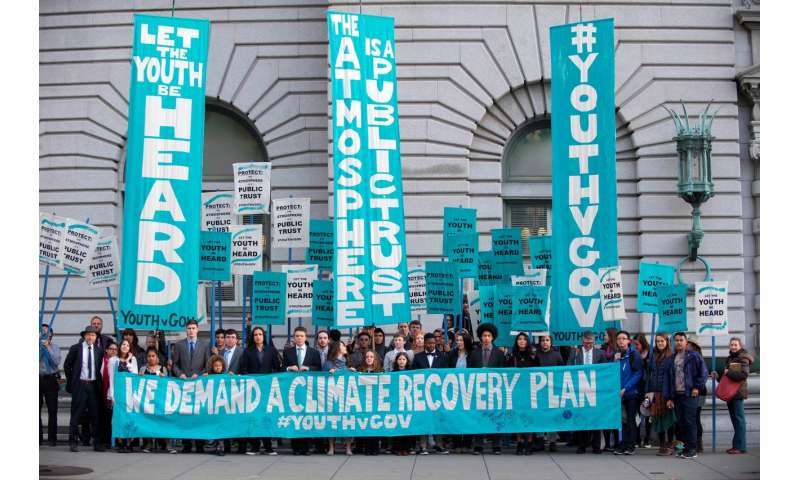 The 21 youth plaintiffs, who now range in age from 11 to 22 years old, are seeking to require the federal defendants to prepare and implement an enforceable national remedial plan to phase out the excessive greenhouse gas emissions that cause climate change. The trial is scheduled to begin Oct. 29 unless delayed by the Supreme Court. The district court in Oregon issued a decision reaffirming the case's core claims on Oct. 15. Currently, the fate of this case hangs in the balance due to a motion to stop the proceedings, filed by Justice Department lawyers in the U.S. Supreme Court just 11 days before the scheduled trial. The Supreme Court had refused the Trump administration's prior effort to throw out the lawsuit in July 2018. This time, the court temporarily put the trial on hold the next day. Attorneys for the youth plaintiffs have since filed a response with the Supreme Court to this latest of many attempts by Justice Department lawyers to stop the climate trial from going forward. Should the Juliana case succeed, there would be a court-supervised federal plan to shrink the nation's carbon footprint at a rate necessary to stave off disastrous levels of climate change. Environmental lawsuits typically rely on statutes or regulations. But Juliana is a civil rights case. It bores down to legal bedrock by asserting that people have constitutional rights to inherit a stable climate system capable of sustaining human lives and liberties. The judicial role in this case is analogous to court-supervised remedies aimed at ending official school segregation after the Supreme Court's landmark Brown v. Board of Education ruling. The district court has rightly described Juliana as "no ordinary lawsuit." As the youth plaintiffs assert, there remains only "an extremely limited amount of time to preserve a habitable climate system for our country." Our Children’s Trust plaintiff Aji Piper gave a TED talk in which he explains why he and 20 other young people are suing the federal government over climate change. U.S. fossil fuel production surged during Barack Obama's presidency even though he did support renewable energy and he engaged in climate-related diplomacy. As the window of opportunity to avert what UN Secretary General António Guterres calls the "direct existential threat" of climate change is about to close under Trump's leadership at a time when Republicans control both chambers of Congress, checks and balances in government matter more than ever before. The U.S., after all, has three, not two, branches of government. In the Constitution, the Founders wisely created an independent judiciary and gave it the responsibility of preventing the other branches from trammeling upon the fundamental liberties of citizens. In the Juliana case, youth plaintiffs are asserting well-established rights under the Constitution's due process and equal protection clauses to personal security, family autonomy and property. They contend that the government's fossil fuel policies jeopardize human life, private property and civilization itself. They further assert rights secured by the public trust doctrine, a principle with ancient roots requiring government to hold and protect essential resources as a sustaining endowment for citizens, in the present and the future. Oregon District Court Judge Ann Aiken issued a landmark decision in 2016 upholding both the Constitution's due process rights and public trust rights, allowing the case to proceed. At that time, she declared, "I have no doubt that the right to a climate system capable of sustaining human life is fundamental to a free and ordered society." Numerous world-class experts plan to testify during the trial in her courtroom to explain the grave threats posed by Trump's energy policies. Judicial alarm over governmental failure to confront the climate emergency is growing around the world, resulting in decisions in Pakistan, the Netherlands, and Colombia that ordered the authorities to act. These cases are all based on similar legal arguments: that governments have an obligation to protect their citizens from climate change. A Dutch appeals court, for example, has ordered the Dutch government to cut emissions by 25 percent from 1990 levels by 2020. In trying to get the case thrown out, Justice Department lawyers for the Trump and Obama administrations alike have contested the jurisdiction of the district court over these claims. The Trump lawyers also argue that a 50-day trial would impose an undue burden and cause irreparable harm. But for the Supreme Court to stop the case on the eve of trial would disregard the standard judicial process. The courts use trials to develop a full record to determine constitutional violations. In our view, following the controversies and turmoil surrounding Trump's Supreme Court nominees, the credibility of the judiciary itself is fragile. Rallies planned around the country in support of the litigation could soon turn to protests against a perceived abrogation of fair judicial process if the case does not go to trial. We think that this climate lawsuit should force everyone to see what a fleeting – and terrifying – moment in history this is. With humanity's very ability to survive on the planet hanging in the balance, the stakes could not be higher.